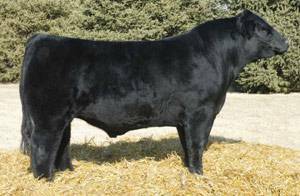 Hefner is a Hotline son out of DVMM Western Lady, who is a maternal sib to famous breed-leader, Jazz). Hefner owns true performance and showring eye appeal. The first calf reports in Oklahoma are very promising. 10 head unassisted, thick, with freaky fronts! A royal pedigree in an affordable package and a name that won't be forgotten, Hefner!